Home > Shop By Brand > Pinnacle Natural Brilliance > Pinnacle Paintwork Cleansing Lotion 128 oz. Pinnacle Paintwork Cleansing Lotion 128 oz. Think of this as an anti-aging cream for your car's paint! Automotive paint loses its luster due to the effects of dirt, rain, and environmental pollution. Wax certainly helps lessen the impact of these assailants, but even wax can build-up and reduce the shine. Pinnacle Paintwork Cleansing Lotion is designed to turn back the clock on your paint by undoing the build-up, the swirls, and the haze to reveal the clean, vibrant paint that lies beneath! Pinnacle Paintwork Cleansing Lotion will restore and preserve your car's original beauty. Paintwork Cleansing Lotion uses a combination of gloss-enhancing oils and micro-fine fillers to polish your car without abrasives. The VOC compliant formula is safe and gentle on all finishes. Simply wipe it on, allow a haze to form, and buff gently. Minor swirls and surface imperfections disappear like magic. Your car's finish will emerge bright and clean, ready for your favorite wax or protectant. This is a mild polish best suited for newer vehicles or vehicles with good paint condition. It is designed to safely take off old wax, embedded road grime and pollution that washing will not remove. It prepares the surface for waxing by creating a clean, smooth, highly-reflective surface. This insures a uniform shine and maximum wax bonding. Tech Note: Paintwork Cleansing Lotion will not remove paint or clear coat finishes. Likewise, it will not remove swirls. It makes swirls less noticeable or invisible by rounding over the top edge of the swirl, robbing sunlight of a sharp edge to cause a reflection. Micro-fine fillers (1.4 micron) in the lotion then fill in the swirl. When you wax over these fillers, most swirls will disappear. These swirls may re-appear as the wax ages and may be revealed under some light conditions (Fluorescent lamps are ruthless, revealing flaws and swirls that will not show under normal sunlight.). 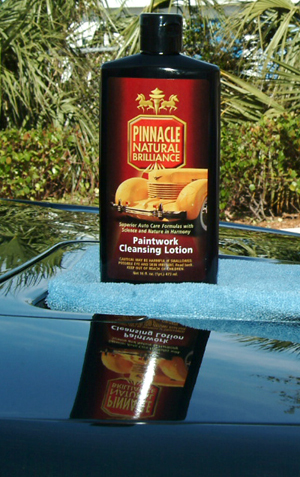 Wash the vehicle with Pinnacle Bodywork Shampoo and towel dry with a Cobra Microfiber Waffle Weave Towel. 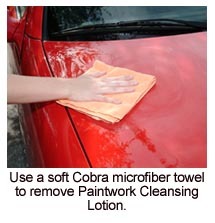 Apply a nickel-size amount of Paintwork Cleansing Lotion to a foam or microfiber applicator pad. Spread it over a 2 sq. ft. section using light pressure. Working in a back and forth motion will lessen the likelihood of producing swirls if a piece of dirt becomes trapped in the applicator pad. The lotion will dry to a haze. Buff lightly with a soft, clean microfiber towel. You can also use the Pinnacle Polishin' Pal to apply Paintwork Cleansing Lotion. A 4 inch white pad will enhance the cleaning properties of the lotion and keep your hands clean during application. Wash the vehicle and towel dry. Mist a white polishing pad with Crystal Mist Detail Spray to allow easier application. Pour a circle of Paintwork Cleansing Lotion on the pad. With the machine turned off, spread the lotion over a small area. Set the max speed at 4.5 or 5 and turn the machine on. Polish in a figure-eight pattern until the lotion begins to dry or disappear. Buff with a clean microfiber towel. Continue to the next section until youï¿½ve polished the entire vehicle. Always follow Paintwork Cleansing Lotion with a coat of wax. Souveranï¿½ or Signature Series II will give your vehicle a glossy, wet-looking shine. Note: For best results, apply Paintwork Cleansing Lotion out of direct sunlight. Do not apply to hot body panels. Paintwork Cleansing Lotion is not designed for use with high speed rotary polishers. We suggest these money saving kits that contain Paintwork Cleansing Lotion. Each kit is thoughtfully assembled by our expert car care professionals. Purchasing in kit form insures you have all the products and tools needed to successfully acomplish your goal. This product (Liquid Souveranï¿½) is incredible. I have been using Pinnacle products for about a year and, in my opinion, the entire line is of the very best quality and yields results far superior to others. Souveranï¿½ Paste Wax, PCL, Crystal Mist, and the leather conditioner are my favorites. Last weekend, I clayed my ML 55 AMG (cognac), polished with 3M Swirl Remover, then used Pinnacle PCL, and completed the detailing with Souveranï¿½ Paste Wax. Today, after washing, I applied Liquid Souveranï¿½ and the finish is spectacular. The Liquid Souveranï¿½ seems to have increased the reflectivity; the vehicle has never looked better. I also tried the new leather cleaner and conditioner; it too is exceptional. This coming weekend I plan to follow the above protocol with my magma red SKL32 AMG. The Liquid Souveranï¿½ is underpriced; at $50, it would be a bargain. The Universal Dispenser Pump neatly dispenses 1 ounce per stroke. It fits 64 oz. and 128 oz. bottles. Choose the pump option in the drop-down menu in the order box.